This week I fulfilled a long held wish – to attend a live performance of John Cage’s infamous and iconoclastic ‘silent’ work 4’33”. The performance was part of a special visit to a recording studio at City University to see how Edition Peters create content for the innovative and high-spec Tido Music piano app. This involves a filmed masterclass where the pianist (in this instance Adam Tendler) sets the work in context, with information about its creation and critical reception, and advice on practising the music, together with a live performance (more about Tido Music here). The decision to include 4’33” in the Tido Music library is entirely due to the work’s extraordinary and for some, controversial, place in twentieth-century music – and for pianist Adam Tendler the work should be regarded as a “standard” of piano repertoire. Ever since its premiere given by David Tudor on August 29, 1952, in Maverick Concert Hall, Woodstock, New York, as part of a programme of contemporary piano music, the piece has courted controversy and opprobrium, its detractors claiming it is not “real music” or that the work is some kind of joke. Some audience members felt cheated or angered by the performance, saving their loudest, most uproarious protests for the post-concert Q&A session. “Good people of Woodstock, let’s drive these people out of town!” someone reportedly shouted after the concert. So why is 4’33” so controversial? When John Cage conceived it, in the years immediately after the Second World War, he was attempting to remove both composer and artists from the process of creation. Instead, by asking the musicians specifically not to play, Cage allows us, the audience, to create our own “music”, entirely randomly and uniquely, by listening to the noises around us during four minutes and thirty-three seconds of “silence” and removing any pre-conceptions or pre-learned ideas we may have about what music is and how it should be presented, perceived and received. The work is an example of “automaticism”, and was, in part, Cage’s reaction to a seemingly inescapable soundtrack of “muzak”. Neither composer nor artists seemingly have any control over or impact on the piece; the piece is created purely from the ambient sounds heard and created by the audience. In this way, the audience becomes crucial: this aural “blank canvas” reflects the ever-changing ambient sounds surrounding each performance, which emanate from the players, the audience and the building itself. Maverick Concert Hall, where the work was premiered, is partially open to the elements, and thus the audience at that first public performance could hear the “accidental” sounds around them: birdsong, the wind in the trees, rain on the roof, and the sounds of the audience members themselves. This of course was one of Cage’s intentions for the piece – to prove that the absence of musical notes is not the same thing as silence. Cage was not the first composer to conceive a piece of music consisting entirely of silence: examples and precedents include Alphonse Allais’ 1897 Funeral March for the Obsequies of a Deaf Man, consisting of twenty-four blank bars (Allais was an associate of Eric Satie, a composer whom Cage much admired), and Yves Klein’s 1949 Monotone-Silence Symphony, an orchestral forty-minute piece whose second and last movement is a twenty minute silence. And there are examples from the world of visual art too: American artist, friend and occasional colleague of Cage, Robert Rauschenberg, produced a series of white paintings, seemingly “blank” canvases, which change depending on the light conditions of the rooms in which they are hung, the shadows of people viewing them and so forth. Like Cage’s work, Rauschenberg’s canvases are brought to life by their viewers and the venue in which they are exhibited (I saw one of Rauschenberg’s White Paintings at a retrospective at Tate Modern, together with other works dedicated to his friend John Cage, and the canvas really does shift and alter depending on the conditions of the room in which it is displayed). There are parallels with other visual artists too, including Carl André and Marina Abramovic, both of whose work explores the relationship between artist, artwork and audience, the limits of the body, and the possibilities of the mind. On another level, Cage was challenging – and exploiting – the conventions of traditional concert hall etiquette. By programming a work to be performed at a prestigious venue, with high-status players and conductor, the audience’s expectations are heightened long before the performance begins – think of the excitement and anticipation generated when Simon Rattle, Daniel Barenboim or Jonas Kaufman come to town. Cage was also experimental – he liked to try new things and challenge conventional ways of doing things. For him art was “a sort of experimental station in which one tries out living.” I am sure he felt the audience’s reactions – curious, puzzled, angry, intrigued, amused – to 4’33” were as interesting as the concept of a silent piece of music. Later in his life, Cage stated that he played 4’33” every day, and the notion of incorporating 4’33” into one’s daily practising regime is very appealing, never more so in our noisy, fast-paced, always connected modern world. The work was composed, in part, as a reaction to “muzak” and the “background noise” that seems to invade every corner of our lives. I’ve become more and more aware of this when I am out and about. There is music everywhere and it’s becoming increasingly intrusive – it’s in bars, cafés, restaurants, shops, leaking from other people’s headphones, even my bank, often at a volume which precludes comfortable speech or hearing, and which invades our conscious, creating unwanted “earworms” or aggravating my tinnitus. It seems that there is some unseen force which requires us to have a soundtrack for every moment of our day. In contrast, 4’33” impels us to to take time out to listen, and really listen. And it encourages a special kind of in-the-moment focus, common to the practice of meditation. This intensity of listening and engagement with the work was very evident at the Tido Music performance by Adam Tendler. The performance took place not in a conventional concert hall but in a small performance space at City University. The audience was very small – just Tido and Edition Peters staff members and I, no more than 15 of us. The excitement and anticipation of the performance began before we entered the room, much in the same way as it would if one was at Wigmore Hall or the Proms. The pianist was seated at a gleaming Steinway D which stretched before us like a sleek black limo. On the music desk was the score and a stop watch. After a very interesting, articulate introduction to the piece (for the benefit of the Tido Music app content), Adam was invited by the film crew to begin when he was ready. A palpable ripple of expectancy vibrated around the room, a couple of people primed their smartphones to take photographs. I had expected to be able to hear the ticking of the stopwatch but it was not audible at all. Instead I heard the hum of the air-conditioning, the stomach gurglings of the person sitting next to me, someone stretching their legs. And all around me I could sense everyone else listening very intently, focusing, engaging. It was a remarkably intense experience, an intensity which made 4 minutes and 33 seconds feel much longer than it actually was in real time. When the performance ended, there was an audible collective sigh and the sense of the tiny audience releasing, unwinding, relaxing, before the applause came. The actual performance began when Adam lowered the fall board of the piano and started a stop watch on the music desk. 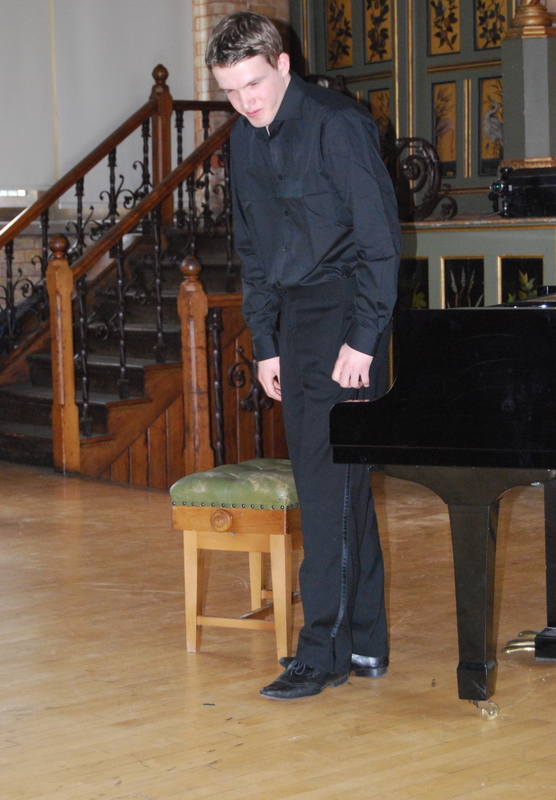 He sat almost motionless at the piano, but there was no sense of him disengaging from the performance or relaxing. He might not be playing any notes on the instrument, but he was still performing a piece of music. And this leads to another fascinating concept which 4’33” provokes: the idea of performance and the pianist’s presence, gestures and body language during performance. In a conventional piano recital, the audience’s reactions are largely led by the sounds the pianist makes. But physical gestures and body language are important too (some performers seem to allow exaggerated body language to obscure the music; I’m no fan of this kind of pianistic histrionics). From the moment the performer enters the stage, we are engaging with them via their body language – and vice versa. A bow, for example, is the performer’s way of greeting and acknowledging the audience, just as we applaud to demonstrate our acknowledgement and appreciation (for what we are about to hear and what we have heard). How the pianist comports him or herself at the piano can be crucial to our relationship with both performer and music, and stage presence and bodily gestures create an important channel of communication which can hold the audience captive during a performance. Through gesture the pianist can control audience reactions to the performance – the most basic being the lifting the hands away from the keyboard to indicate the end of a piece. The issue of “what to do between pieces” came up at the recent Diploma Day event, at which I gave a brief presentation on basic stagecraft. A couple of people (adult amateur pianists who were preparing for performance diplomas) told me that they “didn’t know what to do between the pieces” in their diploma recital programme – i.e. how they should comport themselves, or what body language was appropriate. I explained that it very much depended on the music which had gone before and what was to follow in the programme. Some pieces lend themselves to more space or silence between them while others encourage the performer to segue from one to the next. Understanding this ebb and flow of a concert programme and the need to create space and silence within it is crucial to shaping the narrative and energy of the entire concert. Thus, if one wishes to prolong a sense of stillness or meditation after, say, a performance of Takemitsu’s Rain Tree Sketch II, one might simply sit quietly at the piano, head bowed, hands resting lightly on one’s knees, allowing the memory of the sound to resonate in the audience’s consciousness, after the physical sound has decayed. When there are no audible notes, as in 4’33”, the pianist’s presence is even more crucial. If the pianist were to slouch at the piano, or stare around the room, pull faces, or study his finger nails, the presence would be lost, along with any sense that this was a “performance”. Thus to be successful, 4’33” demands the performer to be fully aware, in the moment, present and engaged – and that’s no mean feat when one is not actually required to play the instrument before which one sits. This makes 4’33” perhaps the hardest piece to perform convincingly. Cage eliminates the details of notes, rhythm, tone, and leaves the performer with the basics of presence. It means the handling of (again traditionally) a piano lid, a clock, and a body—fingers, legs, torso. We use these parts of our body as instrumentalists, of course, but 4’33” isolates them, zooms in on them. It puts a microscope onto the passage of time and how our body—the thing that performs— behaves in that time. I can’t tell you the number of times I have attended a fine, accurate, acceptable and perfectly usable performance from a musician who has never actually learned to sit. Performing in front of others is stressful, whether it is to a group of friends at an informal gathering or to a full house at Carnegie Hall. In order to prepare ourselves for such performances, particularly important performances such as an exam, audition or formal recital, it is crucial to “stress test” our repertoire by playing the entire programme in a variety of situations. This process is commonly used by professional musicians, who may choose to play a programme at regional venues before performing at an important venue such as London’s Wigmore Hall. Each time we perform, new things are revealed about our music which inform subsequent practise sessions and help us make our music more refined and, more importantly, secure, thus protecting us against errors, or at least allowing us to skim over slips and minor mistakes so that the “flow” of the performance is not disturbed. This last week I and a friend have been “stress testing” our respective programmes for forthcoming concerts. I am fortunate in that I own a very beautiful antique grand piano, which piano-playing friends of mine love to come and play (and I love hearing the piano played well by others). Playing for a couple of friends, in a relaxed atmosphere with cups of tea and cake, allows one to play in a “safe zone”. In these situations, we know that our friends are not judging us, they listen attentively and offer encouragement and applause afterwards. Of course, it can be difficult playing to other pianists – but it can be a sympathetic experience too as we all understand how very hard it is to play the piano! I played three pieces, by John Field, Schubert and Schumann, which form the solo element of a longer concert which I am giving with a singer. In practise, the pieces felt secure and well-known, but, interestingly, weak spots were revealed when I played to my friends which subsequently enabled me to practise with care and focus. In addition to helping us focus on practising, “stress testing” our repertoire allows us to gauge aspects of our performance, from our concert attire and stagecraft to the vibrancy and expression of our playing (and yes it is important to do a “dress rehearsal” to make sure clothing and shoes are appropriate and comfortable). It also enables us to better understand and handle anxiety and stage fright: and the more times you practise performing a programme before The Big Day, the better you become at recognising and accepting the symptoms of performance anxiety. Of course this preparation for performance presupposes that one has done all the careful, detailed work learning the music, including being able able to work both too slowly (a musical challenge) and too fast (an efficiency challenge), one hand thinking the other and using the wrong hand (see Graham Fitch’s useful article on symmetrical inversion), working with and without the metronome, studying the music away from the piano and in one’s head, and creating a vivid, perfect interior model of the music, while all the time guarding against routine and a lack of mindfulness. It’s hard work: there’s no getting around the fact that playing the piano is very difficult, regardless of one’s ability – as Graham said to me the other day, “if it was easy, everyone would do it!”. Returning to the subject of practising for a performance, I had an interesting experience with one of my more advanced students recently, a teenage girl who was preparing to take her Grade 6 piano exam. I have done a lot of work on confidence and stagecraft with her, and at the last lesson before her exam, she wanted to run through her pieces. After three false, frustrating starts to the C P E Bach ‘Solfeggio in c minor’, with me sitting quietly next to the piano, I suggested we try something different. I told her about the Canadian pianist Angela Hewitt whose stage presence suggests someone who loves performing and who can’t wait to share her music with the audience. “Channel your inner Angela Hewitt!” I suggested to my student, and then asked her to leave my piano room, wait in the hall (as if backstage at the Wigmore) and then “come on” to the “stage”. Meanwhile, I moved away from the piano and sat “in the audience” on my sofa. The transformation in her performance was remarkable: she was confident and poised and she made a wonderfully vibrant sound. She was thrilled with her performance, and when she saw me after the exam, she explained that she had done the same visualisation/acting exercise in the moments before she went into the exam room. I am delighted to report that she passed her exam with a high Merit and received very complimentary comments from the examiner about the communication and expression in her playing. As performers, we have to be actors, partly to enable us to cope with the feelings of anxiety, but also to allow us to step into the character of each piece we play. All these aspects need to be practised and tested before the The Big Day. Curiously, the more of this work we do in the weeks and days leading up to the important performance, the better able we are to “let go” in the actual performance, to play in the moment and to allow the creative and artistic side of our personality (often called “right brain thinking”) to take flight. On performing: the highs, the lows and everything in between…..
Last week, I gave a formal concert as part of the South London Concert Series (of which I am Artistic Director) at the wonderfully eccentric Brunswick House, in the ‘Embassy quarter’ of London’s Vauxhall. Part of the London Architectural Salvage and Supply Co (LASSCO), Brunswick House is a magnificent Georgian mansion just a stone’s throw from Vauxhall Station, the MI5 building and the glittering new apartments of the Nine Elms development. The house is home to an eclectic collection of antiques and salvaged curiosities, all of which are for sale, including the early twentieth-century Bechstein grand piano which graces the opulent first floor Saloon (price £6000). The venue provides a great backdrop to the kind of programmes I favour (an eclectic mix of music of different eras and styles) and also acts as a splendid talking point for the audience who can enjoy exploring the rooms beforehand. I was joined in the concert by four pianist friends, three of whom have careers outside of music for their “day jobs”. And this for me is where it gets interesting…..
All of us had clearly prepared very carefully for the concert: we’d had “practise performances” at home, for friends, and at our piano group, and I had already played the pieces I was performing at two public concerts in the weeks leading up to the Main Event. We had all tried the piano at Brunswick House in advance of the concert, and I spent a couple of hours there with the tuner a few days before the concert. On the day of the concert we arrived in good time, warmed up, chatted to one another, set up the video camera and checked the lighting over the piano, and then waited quietly for the concert to begin. No one betrayed any nerves, nor discussed how they might be feeling: we all knew that we had to deal with our anxiety in our own way. What was most evident to me was the sense of excitement and anticipation amongst my fellow performers (and I admit I was pretty excited too – the concert was a sell out and the audience mostly comprised friends and family which made for a very warm atmosphere). We all performed with confidence, poise, musical understanding, sensitivity and expression. Because we were playing music we liked and enjoyed, the experience was wholly pleasurable, and I think our affection for the pieces we had selected, and our friendship, shone through every note. Anyone who thinks performing to a roomful of people is “easy” needs their head examined. Of course it may look easy – and one of the great skills of the performer is to present what appears to be an effortless, fluent and convincing performance. In order to reach this point, one will have put in many hours of lonely practising – note-learning, refining, adjusting and finessing the pieces. Each performance throws up interesting new things or highlights areas which need to be worked over again to be made more secure (this is why it is important to perform a programme several times). On top of this, one needs to know how to cope with the inevitable performance anxiety, to hone one’s stagecraft, select the right outfit for the occasion, practise wearing the concert frock and shoes (for women), try the piano at the venue, talk to the tuner, if applicable, find out where the green room/loos are, and generally do as much as possible to remain calm and focused in the final moments leading up to the performance. On the day of the performance, whether it is a concert or a recital for an exam, festival or competition, I have a clear strategy which I always follows to ensure I arrive at the venue with a clear head and a rested body. Rushing around, over-practising or doing too much can leave one feeling drained and flustered, and this can heighten one’s anxiety. In all the excitement of the actual performance, it’s easy to forget that one expends a vast amount of energy, in particular brain energy: keeping body and mind rested in advance of the performance is crucial. When I arrived at Brunswick House a couple of friends of mine were already at the bar and greeted me eagerly, admiring my dress and wishing me luck for the occasion. I didn’t want to linger to chat (keeping the head clear!) and I promised I would speak to them afterwards. In terms of final preparation, lately I have become interested in “mindfulness” and have been applying it to my performing. At a concert I gave in a very cold church on a less than perfect, but huge Petrof piano a few weeks ahead of the Brunswick House gig, I decided to employ some mindfulness techniques to play “in the moment” and not worry about what happened. I was pleased with the resulting performance and instead of dwelling on “what might have been”, I went to the piano to practise the next day with the thought “what can I do differently/better next time?”. Of course there were areas of my pieces which needed special attention, but there was nothing that caused me serious worry. And in any event, after the concert, there is nothing to be done, for we can’t go back and change what has already been. As performers we are often our own worst enemy – and all my pianist friends, professional and amateur, are frightful perfectionists. We worry about our note-learning, our memorisation, our expression, musical understanding, how we communicate to the audience, and so much more – and of course we want to give a note-perfect and characterful performance on The Day. It is crucial that we are perfectionist in the practise room because this will enable us to do the correct, careful preparation for the performance. Looking at the video of the concert afterwards of course there are moments when one might wince a little and wish that you’d played this or that note or phrase differently. The audience, however, enjoys the music in a different way, and a well-rehearsed, fluent performance which is rich in expression and communication will engage an audience, no matter if there are a few slips or errors (in fact, audiences rarely notice the mistakes we fret so much about, and people who go to concerts to gloat about spotting errors in the performance are thankfully a rare breed). The photographs my husband took of the event clearly demonstrate that we had a really wonderful evening: as one of my co-performers said afterwards “it was an unforgettable experience of music and friendship” – and the congratulations and bravos we received from the audience were a testament to how much everyone had enjoyed the occasion. This continued into the bar, some of us staying very late before venturing out into the freezing January night. The day after a concert one often hits the ground with an unpleasant thump. As the adrenaline leaves the body, one experiences a distinct “low”. This is often compounded with a deep tiredness, of brain and body, and it may be hard to motivate oneself to do anything the day after a concert (in fact, I took two days “off” the piano and instead lolled around the house, glum and moody, much to the disgruntlement of the rest of my family!). In fact, the best remedy for this special kind of post-concert depression is to get back to the piano and get working again. In my case, I was excited to start practising again because I had new work I wanted to look at, and other pieces which needed to be brought back up to scratch for a private charity concert in which I am performing in the Spring. What remains of the Brunswick House concert are memories of a very special evening, of music played by friends, with friends and for friends, an important reminder that music was written to be shared. We have photographs too, and videos, as mementoes of the event, and I would like to thank my co-performers, and Rebecca who turned the pages for me, for their special and wonderful contribution to a magical evening. Posted in General and tagged as LASSCO Brunswick House, performance anxiety, performing, preparing for a performance, South London Concert Series, stagecraft. This post was prompted by a conversation over the weekend with a piano friend of mine: we were discussing ways in which students can free themselves from the constraints that prevent them from giving their all in a performance situation, and the expression “playing naked” came up, which I thought very appropriate. It refers not to a means of dealing with performance anxiety where one imagines that the entire audience is naked (an empowering way of turning the dynamic in a stressful situation), but to giving oneself permission to stand back from the music, to let go, and to play with passion and commitment. If you are naked at the piano, whether literally or metaphorically, there is nowhere to hide, and you must do everything in your power to distract the audience from your “nakedness”. (Those of us who perform, and who suffer from the anxiety of performance, may well have had the dream/nightmare where we are in a performance situation without the protective carapace of clothes. ), So, do you run screaming from the stage, or do you face up to the challenge?